Physics and mathematics alumnus Scott Clark (’08) is the recipient of the 2016 College of Science Young Alumni Award thanks to his extraordinary professional accomplishments achieved so early in his career. Named one of Forbes’ 30 under 30 in 2016 from among 15,000 nominees, Clark is in good company: he is one of 600 of America’s best and brightest young entrepreneurs, innovators and leaders. Clark grew up in Tigard, Oregon, and attended Central Catholic High School in Portland before arriving at Oregon State to study mathematics and physics. He is a very proud fourth generation Beaver; his parents, grandparents and great-grandparents graduated from OSU. Clark’s parents majored in journalism during the 1970’s and his father served as the editor of the Barometer. Clark is deeply appreciative of his parents for encouraging his interest in mathematics and science, even though they didn’t have a background in the subjects. “While I was in high school, they presented me with Feynman’s lectures in physics on my birthday,” remarked Clark. OSU was a natural pick for Clark: his family had extensive ties to OSU and the university had a reputation for strong physics and mathematics program. He was a high-achieving undergraduate student, earning three bachelor’s degrees in physics, mathematics, and computational physics in just four years. Clark participated in undergraduate research and received funding through the National Science Foundation’s Research Experiences for Undergraduates (REU) program to study quantum physics at the Max Planck Institute in Dresden, Germany. At the Max-Planck Institute, Clark got to combine physics and computer science for a project on extreme value statistics for chaotic quantum systems. “It was my first taste of getting some of the biggest computers in the world to solve math and physics problems,” recalled Clark. 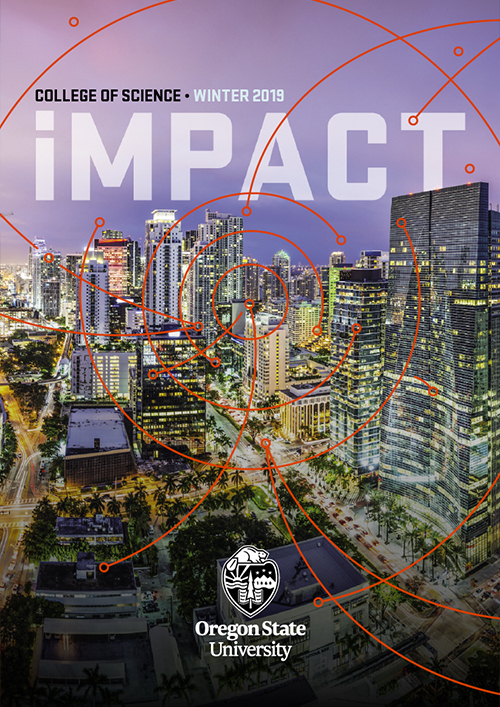 Clark says his educational goal has always been to explore ambitious interdisciplinary projects that hold the possibility of large-scale social and scientific impact. It is a goal that was supported and encouraged in the science and math programs at OSU. Yet another REU award enabled Clark to work on a project in computational biophysics as they applied to protein folding at the University of California, Davis. While still an undergraduate, Clark published the results of this research in a well-regarded academic journal. 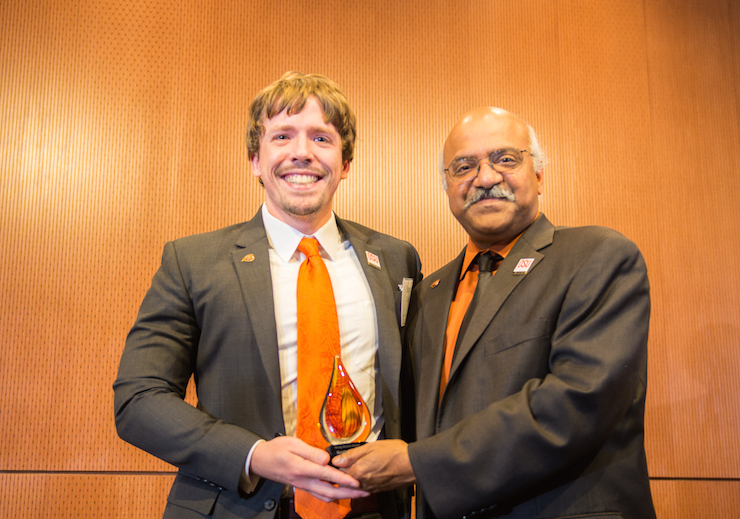 While at OSU, Clark worked closely with mathematics professor Malgo Peszynska on his thesis, “Finite Element Modeling on Uncertain Surfaces,” that was supported by an Undergraduate Research, Innovation, Scholarship and Creativity (URISC) award at OSU. “The exposure to high-level research I got with Malgo gave me the ability to tackle complex problems at the interface of mathematics, physics and computer science. It solidified my desire to go to graduate school and helped me understand how research was done in the real world,” said Clark. After graduating, Clark earned a Ph.D. in applied mathematics at Cornell University. While completing his degree, Clark observed researchers/domain experts often tweaking what they had built via trial and error often in the final stage of their research. So he developed MOE, a global, black box optimization engine for metric optimization, to solve this problem. Later he used this technology to optimize machine learning models and A/B tests at his first job at Yelp. “It is extremely rewarding to unlock academic research and bring it to the real world,” said Clark. Clark was one of the first Ph.D.’s hired at Yelp, where he applied his academic research to developing the black box optimization system that helped Yelp improve its web analytics, resulting in higher click-through rates and an enhanced user experience. In 2014, Clark left Yelp and co-founded, SigOpt, a software company that uses machine learning and complex algorithms to optimize user experiments for websites and other applications. The startup offers a Cloud-based optimization platform that amplifies research by tuning it in place, boosting business objectives. Industries, data science professionals and websites use the software to optimize their products and accelerate projects. The software is used widely by globally recognized leaders across insurance, credit card, algorithmic trading and consumer packaged goods industries. To date, SigOpt has raised $8 million in funding from Andreessen Horowitz, Y Combinator, Data Collective and others.